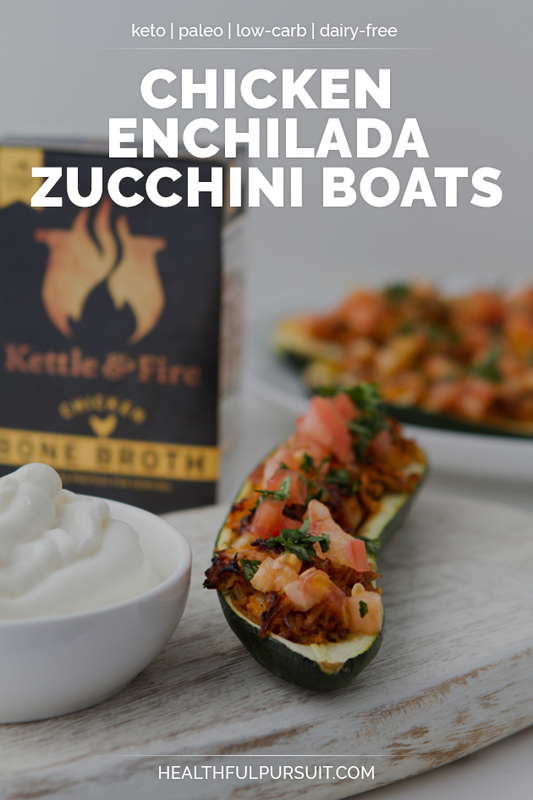 Keto chicken enchilada zucchini boats with the perfect spice blend, tender bone broth simmered chicken, fresh veggies, and all of your favorite toppings with dairy-free options. I might be a day late for Taco Tuesday, but why should we relegate a dinner fiesta to only one day? I’m doing something new: Enchilada Everyday, starting now. The chicken in this dish is simmered for 2 hours in bone broth… it’s juicy and tender and not only does it taste good, it makes you feel bueno, and that’s definitely a reason to celebrate. I mean, look at those colors! 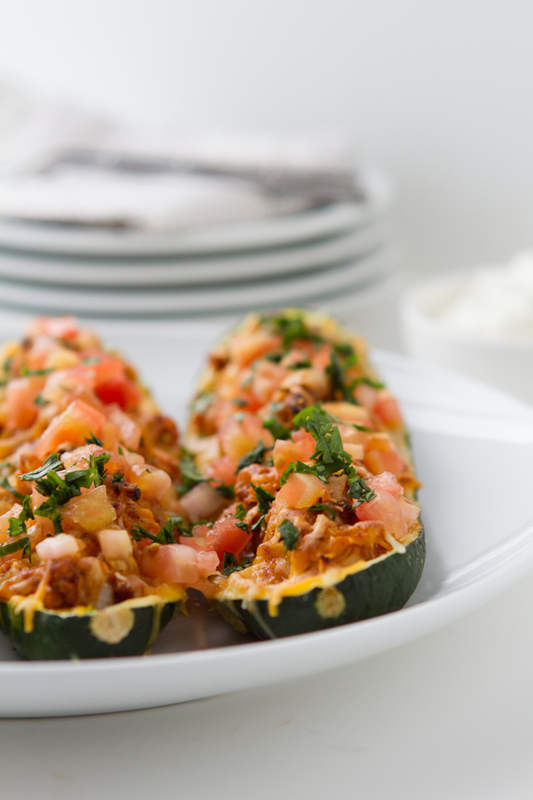 It’s a zucchini boat fiesta, for sure. I used Kettle & Fire Chicken Bone Broth for this recipe because it’s my favorite. I’ve been talking about bone broth a LOT lately – it’s got a ton of health benefits, it tastes great, it’s perfect for keto, and I absolutely love cooking with it. The only thing is, making bone broth at home, (which is an RV for me!) isn’t always feasible. 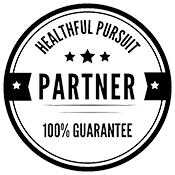 Luckily, I don’t have to worry about making my own bone broth anymore because Kettle & Fire makes shelf-stable bone broths with the highest quality organic free range chicken bones, herbs, and vegetables, and no preservatives or additives. Plus, Kettle & Fire simmers their chicken bones for 10+ hours with apple cider vinegar and sea salt to draw out all the benefits of essential amino acids and gut-supporting collagen. And the best part? Kettle & Fire is offering up to 28% off their Chicken Bone Broth plus free shipping, just for you! Click here to get the deal – fiesta for sure. All the flavors of chicken enchiladas without the gluten! Tender chicken thighs simmered in bone broth for ultimate juiciness, with fresh veggies, enchilada spices, and your favorite toppings. Place chicken thighs and bone broth in a stock pot or your InstantPot Pressure Cooker. If using a stock pot, cover and bring to a boil on high heat. Reduce heat and simmer for 2 hours. If using an InstantPot Pressure Cooker, set to high pressure for 35 minutes. Strain the bone broth from the chicken and shred the chicken in the pot or pressure cooker. 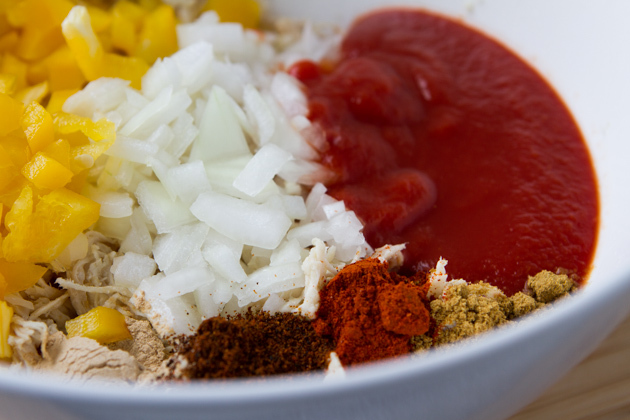 Add the tomato sauce, diced onion, diced bell pepper, avocado oil, chili powder, paprika, garlic powder, ground cumin, ground cayenne, and salt. Stir to coat. 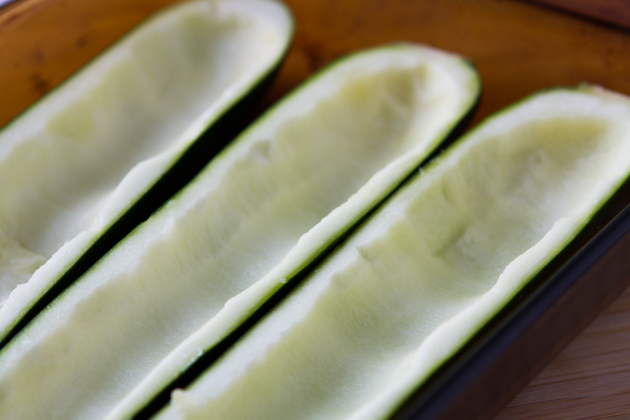 Scoop out the insides from the zucchini pieces, leaving about ¼-inch (6 mm) thickness on all sides. 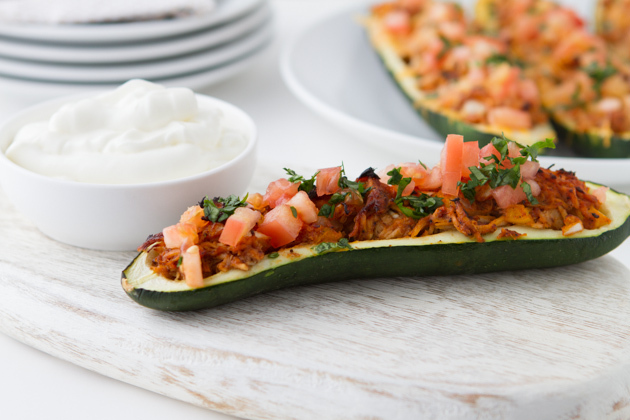 Place the zucchini pieces scoop side up on a cookie sheet. Divide the chicken mixture between the zucchini pieces. Then, cover in cheese if using. 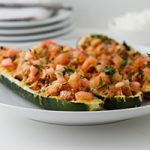 Transfer the cookie sheet to the preheated oven and bake for 25 to 30 minutes, until cheese has melted and zucchini is fork-tender. Remove from the oven and top with sour cream, tomato, and cilantro. Ready to be loaded up with enchilada goodness!